With the advent of the child in the home, his health and safety become a priority. We understand what is worth buying and what to refuse. For children’s room suitable paper wallpaper, water-based paint and wallpaper of natural materials (bamboo, veneer or silk). Such do not emit harmful toxic substances. For the floor, choose the cork. It is a moisture-resistant eco-friendly material that well springs under your feet. You can choose a quality laminate or carpet. But from the warm floor it is better to refuse because of electromagnetic radiation. For the ceiling, it is better to use paint or whitewash, as suspended ceilings collect a lot of dust. Choose furniture from solid wood. Furniture should be environmentally friendly and resistant to mechanical damage. 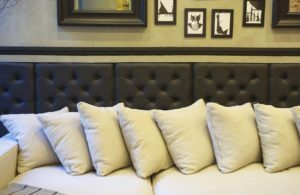 Heavy furniture should be attached to the wall so that it can not be overturned. No synthetics: only natural cotton or linen. Cotton is hypoallergenic and good air permeability. For babies choose a monophonic bedding of light shades. Stick special silicone overlays on tables, tables and shelves so that during the game no one is injured during the catching. Be sure to install the plugs on the electrical sockets. You can choose them under the color of the interior, so as not to stand out. On the door, put the latches and locks so that the child does not pinch his fingers. Special locking locks should be placed on all cabinets with sharp objects, medicines, fragile and expensive things. In the nursery there should be a lot of natural light. If possible, arrange it in a room with windows facing east or southeast. For artificial lighting, soft diffused light will fit throughout the room. For the playing area, there is enough light, and for the working area, additional lighting is needed (table lamps and wall lights).